Back again with a real post! ;) Since I'm behind (thanks again AT&T for keeping me on the phone for 10 hours and not ever setting up my service!) I'm dedicating this week to fall and Halloween swatches. That way I can come just under the wire with posting them in time for Halloween! :P I thought I might as well go with the largest pile of polishes with this "theme" first, so Lynnderella it is! A Holo Haunting contains red, lilac, blue, green and silver holographic shards surrounded by assorted silver holographic glitter in a clear base. 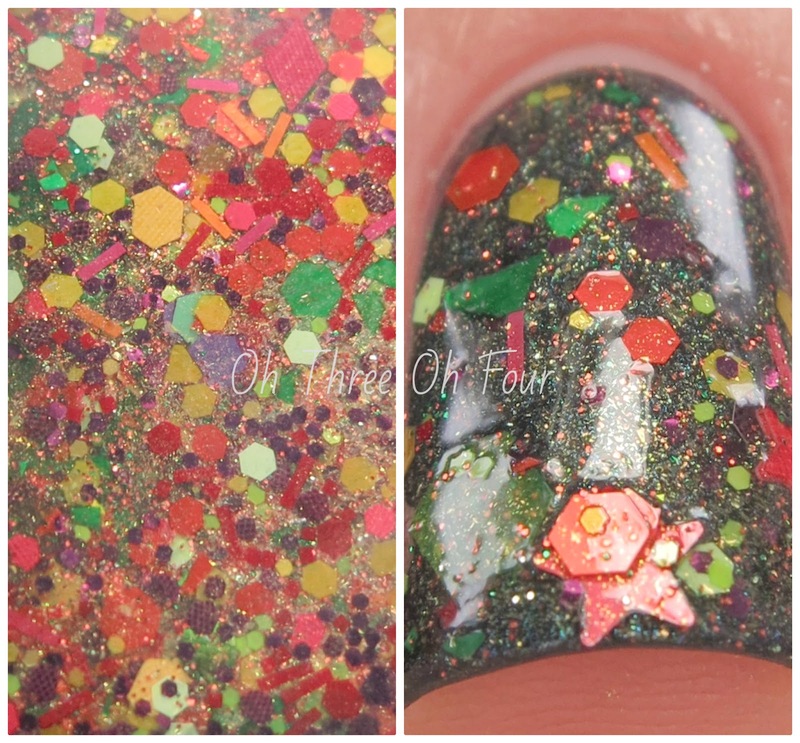 Shown is 1 coat over 2 coats of Illamasqua Gothiqua with an accent nail of 1 coat over 2 coats of Wet n Wild Jealous Lover. 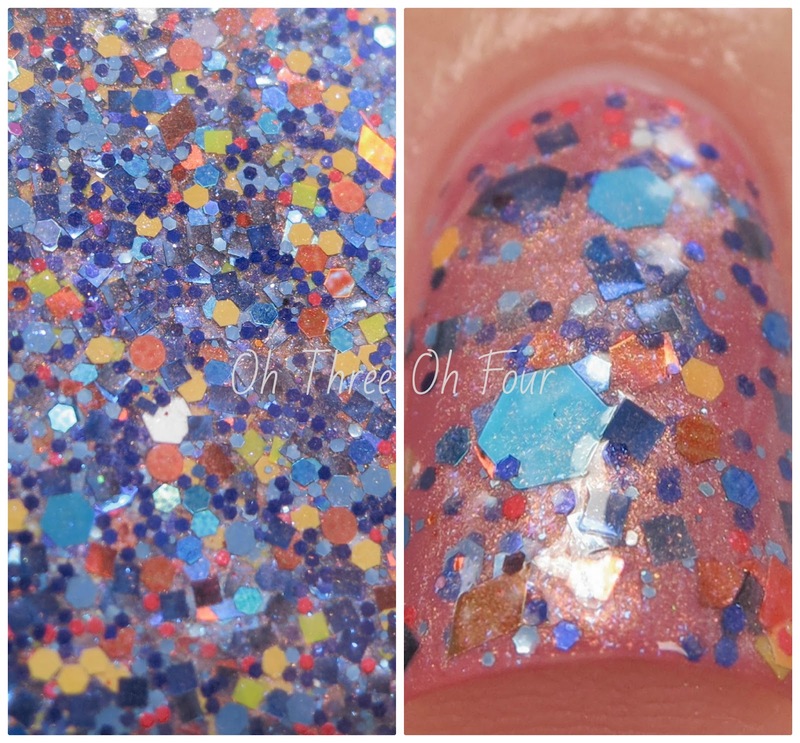 A Ghost of Blue features periwinkle, assorted blue and orange glitters in an orange and blue shimmered clear base. These photos are 2 coats over 2 coats of Chanel Infidèle. 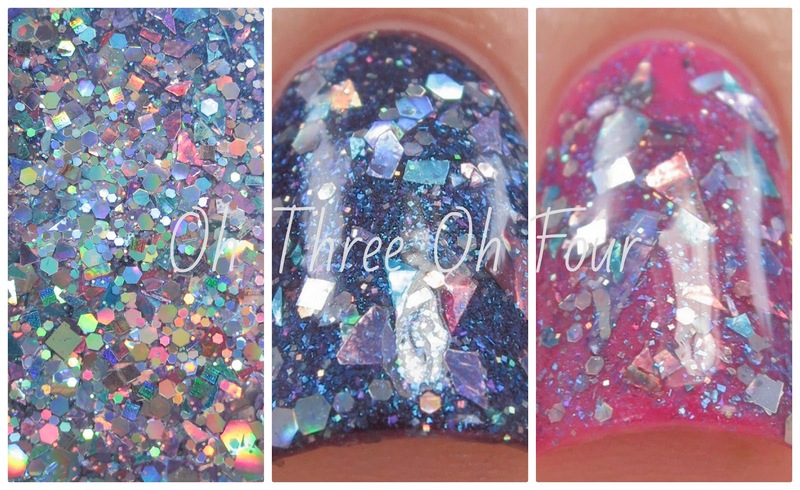 A Ghost of You features periwinkle, assorted blue, magenta and orange glitters in a pink and blue shimmered clear base. All nails are 2 coats of Dance Legend T-1000 with 2 coats of A Ghost of You. Cauldron Drippings is oranges in an sparkling orange base, plus whatever happens to be in the cauldron at the moment. Here is 2 coats over 2 coats of Sephora Jungle Playground. Corpse Reviver is a multi-glitter with pink and white skulls and many other glitters in a strong gold-shimmered clear base. All nails are 2 coats of Corpse Reviver over 3 coats of Revlon Surf Spray. Every Witch Way contains inky black and blue holographic and metallic glitters in a deep blue-violet-shimmered base. 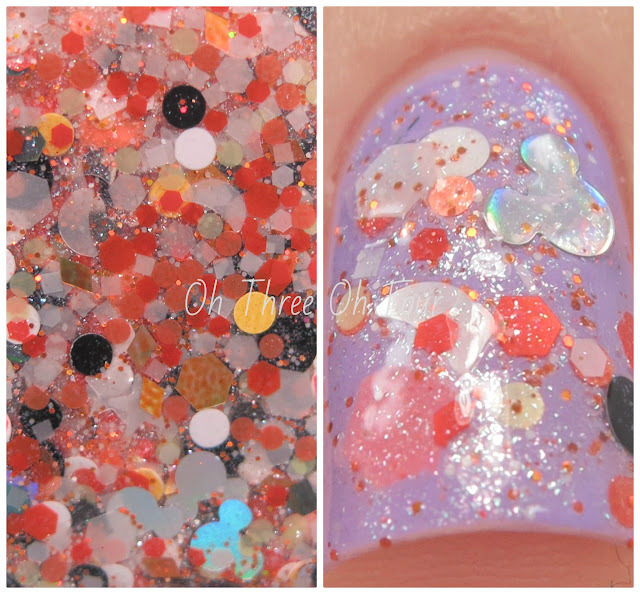 These photos are 1 coat of Every Witch Way over 2 coats of Dance Legend Spectrum. 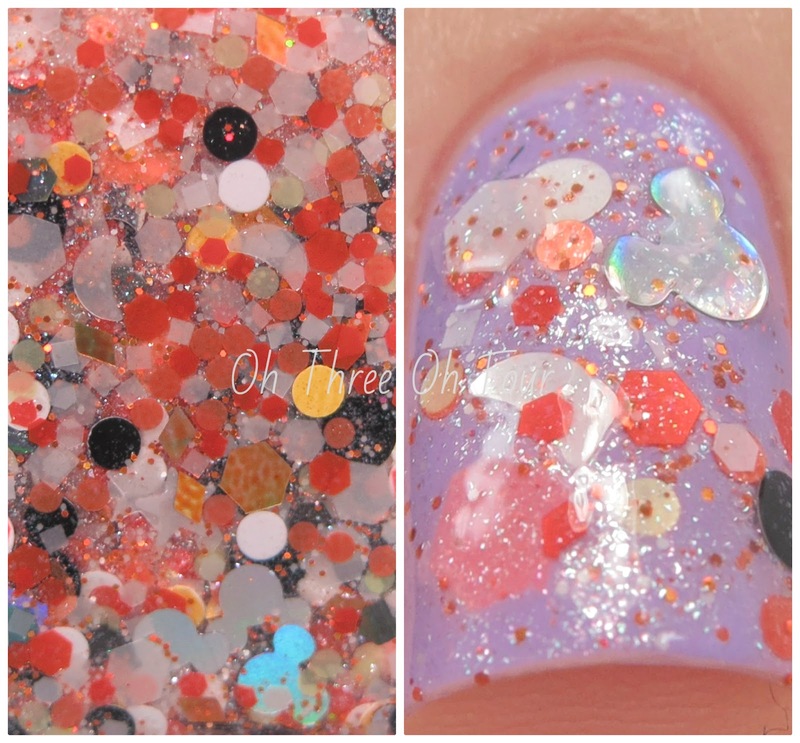 Jack's in Love with the Maenad has an orange jelly base with assorted large multi-glitter shapes. It also comes with a candy box full of extra nail art glitter: pumpkins, stars, bars and maenads. 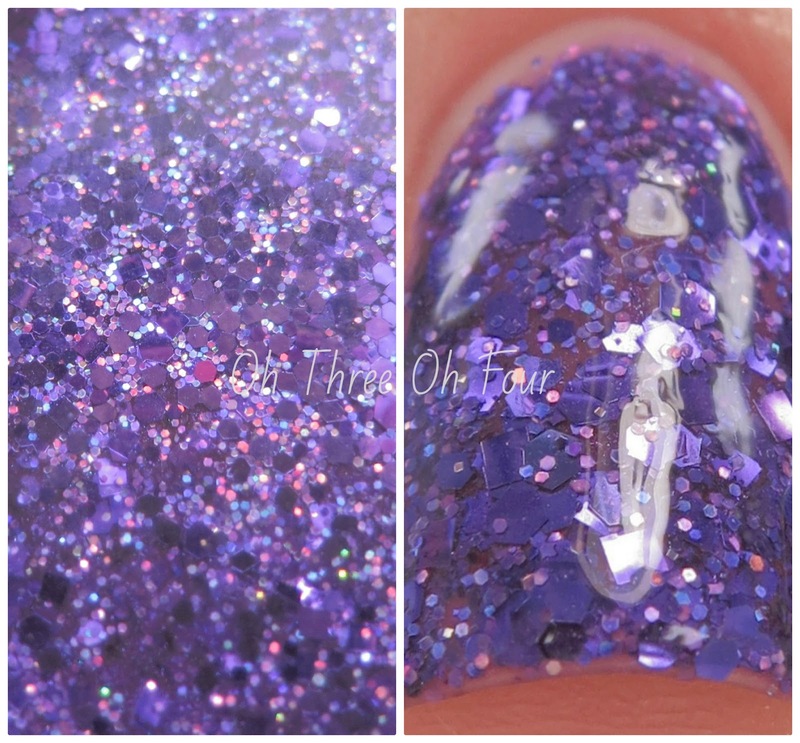 Shown is 1 coat over 2 coats of Sinful Purple Heart. Leaf Motif has a plentiful assortment of satin, metallic and opaque matte glitters in an intense warm gold-shimmered clear base. 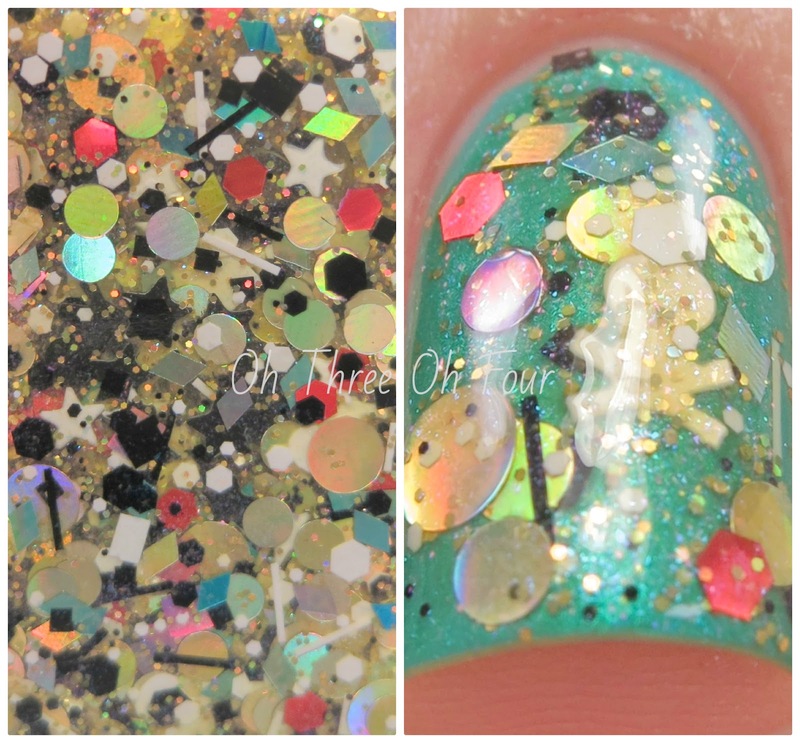 These photos are 1 coat of Leaf Motif over 2 coats of Wet n Wild Sea Ya' Soon. Love Potion No. 99 contains purple, violet and fuchsia hexagons and squares in multiple size, as well as violet holographic micro glitter in a tinted purple base. All nails are 3 coats with top coat. Mickey Says Boo! is made with assorted black, orange and white glitters as well as silver holographic Mickeys in an intensely white-shimmered clear base. Here is 2 coats over 2 coats of Q.R.S. News of the Beloved. Mostly Ghostly is a blend of translucent and opaque white glitters in assorted shapes and sizes in a new, translucent, frosty cool pink-shimmered base with blue, pink and white sparks. Shown is 1 coat over 3 coats of Sinful Shine Go Glossy. Pirate Costume contains black and white shapes and skulls, holographic gold doubloons and assorted jewel-toned glitters in a multi-shimmered base. All nails are 2 coats of Pirate Costume over 2 coats of Sephora X Prism. Very Pretty Vampire is multiple sizes of burgundy hexagons and squares in a clear base with scattered black and red multi-sized accents. Shown is Very Pretty Vampire used as a gradient over 2 coats of Wet n Wild Ghoul Time. Witch Fairy? is a multi-glitter made with holographic green, blue, black, grey and lavender glitter along with red micro-glitter accent in a clear multi-shimmered base. 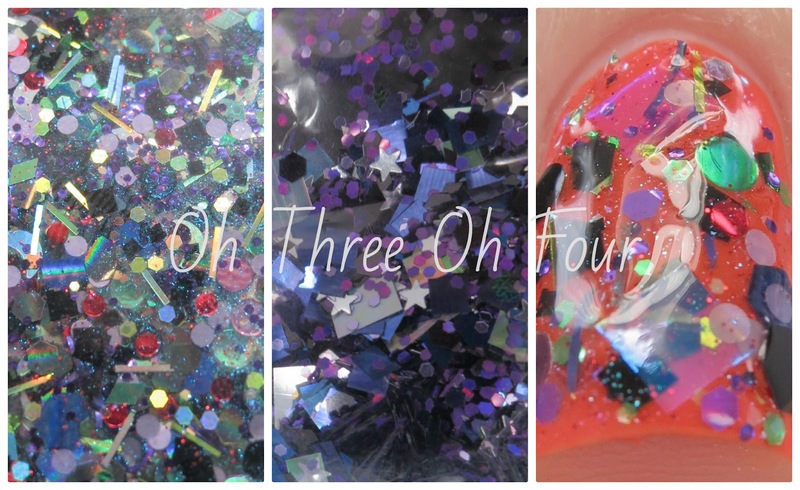 It also comes with accompanying nail art glitter includes blacks cats, intense purple holographic hexagons, big holographic and iridescent squares and black assorted holographic hexagons. 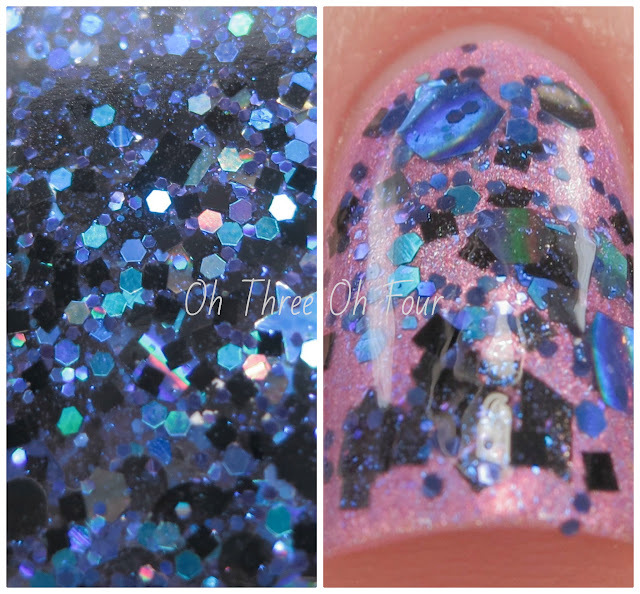 For these photos I used 1 coat over 2 coats of Wet n Wild Jailhouse. Find Lynnderella Lacquers through Lynnderella.com and internationally through Norway Nails and Glitter Connect. Make sure to follow all the Lynnderella fan pages on Facebook, Twitter, Instagram, Pinterest and Tumblr!